Well, I'm finally back from lurgy hell. I can't believe how long I've been sick. I think I had two/three different cold viruses back to back. I haven't felt so "sick" in ages. I have said this before, I'm sure, but I'm pitiful when I have a cold. I just couldn't think straight and didn't feel like doing much knitting and several days I didn't pick up any craft whatsoever, which is a sign that I'm properly sick. So I haven't actually produced much over the last few weeks, but spinning was something I could just about manage, because it was brainless. 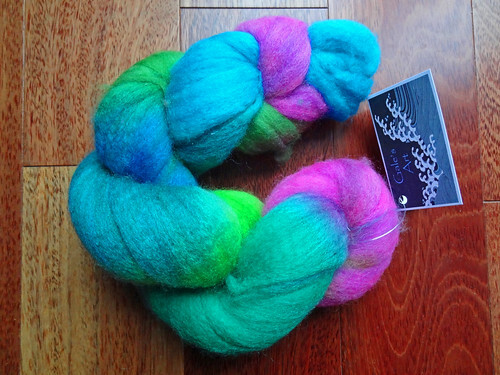 I picked up some fibre that I've had for a little while, bought in November 2013, it was some BFL from Gale's Art. I'd heard about Gale's Art on a few podcasts but it was The Fat Squirrel Speaks that really sold me on how lovely it was, so I caved and had a look at the ETSY store. 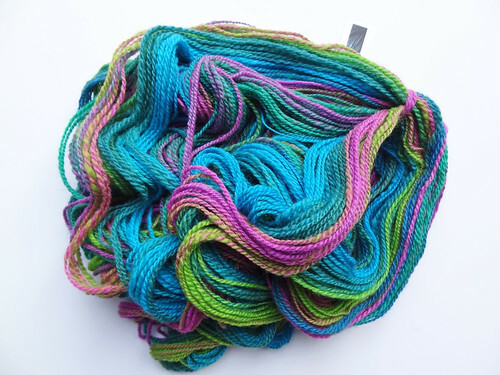 The colours are amazing and Amy Beth raved about how amazing the fibre prep is. As soon as I visited the store I saw this particular fibre and knew I had to have it. The colourway is Proud Peacock and it was dyed on 115g/4oz of Blue Faced Leicester Top. It was as bouncy as it looks. 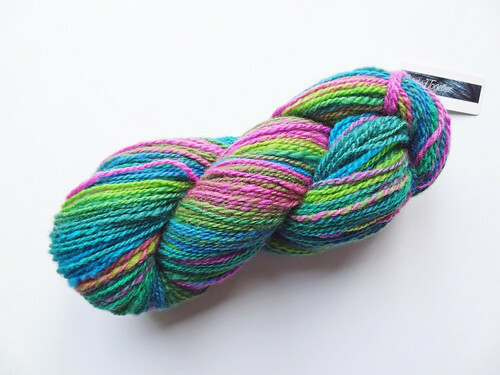 I bought this colourway as it was due to be discontinued in 2014 and the colours made me so happy I knew I would be disappointed to miss out on buying it. The fibre was dyed in repeated blocks of colour and I decided I wanted to keep those repeats to make stripes. I thought about doing chain plying but decided that I wanted to try making stripes in a different way. I knew I wanted to spin a nice loose and soft single to keep the bounce from the top, so I thought it would be better to create a 2-ply yarn. I laid the fibre out and could see the colour repeated evenly four times through the top which seemed a useful thing to me. I split the fibre into 4 sections across the top, rather than through the length of the top. It was just easier to do it that way, especially as the sections were dyed so uniformly. I then spun each section worsted style, ensuring whilst spinning that the single remained quite lofty. I used my Enid Ashcroft Ebony and Bocote Tibetan spindle to spin this (and yes it is another new spindle, I can't resist her updates!). I then spun two plies together, ensuring the colour repeats lined up. It resulted in a very fat cop! I just managed to squeeze each "skein" on the cop to produce two skeins of yarn with pretty evenly matched repeats. I was really pleased how quickly this project spun up, it took 2 weeks from start to finish, whilst I had the lurgy. I was also very surprised how the well the stripes lined up. It goes to show how accurate the dying throughout the length of top had been. There are just a few sections of barber poling but that actually adds to the yarn and makes it look more hand spun. 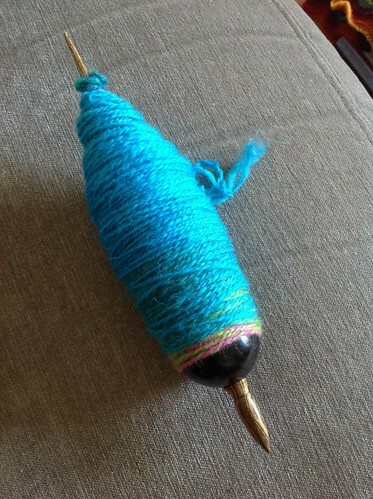 If I'm going to all the effort of spinning my yarn I want it to look like I have! I always tie my skeins together as I wind it round the niddy noddy as it makes it easier to handle when I soak and finish it, and when I calculate length I treat it as one skein. I soaked the finished yarn and squeezed all the excess water out using a new purchase, a Highlander Microfibre Bath Towel . It dries really quickly and absorbs as much water as a heavy bath towel. It is more compact which means I can really squeeze it without having to take my socks off to stand on it, which is what I used to do. It is also less fuzzy so it doesn't pull at the fibres of what I'm blocking as much as a regular towel. Once the skein was less wet I snapped it a couple of times and left it hanging to dry. The resulting yarn is exactly what I wanted. It is light and airy, but it is smooth and strong. I have 221m of a DK weight yarn, and I'm really pleased with that yardage. It's pretty balanced too. You can see in the above photo how some of the yarn is slightly barber poled at the transitions between the colours, but I like it. I think without those sections the stripes would be almost too uniform. I'm pretty pleased with the consistency of the spinning and the plying, though of course it's not perfect and there are some areas where there are thinner and thicker sections, but they mainly even out. I would happily buy fibre from Gale's Art again. Her colour sense is very compatible with my own aesthetic tastes, as well as having beautiful prep. 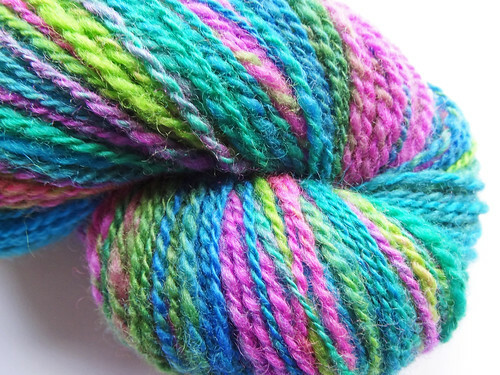 The colours in this yarn make me so happy. They feel very Spring like. I've been searching for something to knit, with this yarn, as I want to cast it on straight away. I thought about doing mitts but then I remembered the Cattywampus Hat by Elizabeth Green Musselman of Dark Matter Knits (a great video podcast, by the way). The hat is knit sideways on the bias and has an interesting texture. I think it would really show off this yarn well. I'm pretty sure this is what I'm going to knit, but would love any suggestions for a great DK weight pattern that shows off stripes! I'm so happy with this project and I feel like I'm finally "getting it" with spinning. It feels like my muscle memory is embedded at last!